A couple of weeks ago I had the opportunity to join the head of security in Shaarei Tikva, on a tour of the community. It wasn’t my first visit there — I have had family members living there for many years. But it was the first time I was exposed to the safety challenges that the people of Shaarei Tikva deal with each and every day. We drove up to one of the highest points in the community, on the perimeter of the community, where we were able to see the nearby Arab villages. I was shocked at how close they were to the houses of Shaarei Tikva. My hair literally stood on end as I listened to Tzur, the head of Shaarei Tikva’s security department, provide a security update which detailed the security challenges they face from these villages. As Tzur shared the intense routine that comes with the job, and it is a full time job, I felt a certain familiarity. Especially when he talked about the volunteers on the Rapid Response Team, putting in nights and weekends to help protect the community. 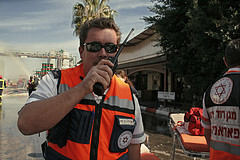 My husband, Adiel, is a member of the Rapid Response Team in our community of Leshem. On Shabbat (the Jewish Sabbath) he takes our four children (ages 2 to 7) to synagogue wearing protective gear and armed. My children know that in case of emergency, they will stay with one of our friends and their father will run out and do what needs to be done to protect everyone. Sometimes he gets called in the middle of the night. Those nights, for me, are the hardest. I remember one time he got a call at 2 AM. I heard him whispering, trying not to wake me, but I had woken up. Sitting on my bed staring at him in the dark, anxious, waiting for an update. “I need to go, lock the door and shut the windows” he said, and he left taking his protective vest, his gun and his first aid bag. In addition to being on the security team my husband is also a medic. Getting called in the middle of the night is not uncommon at our house but this time I could see it was particularly serious. I stayed in bed, trying to calm myself as my imagination zoomed at 400 miles an hour. As the sun was rising I could hear him coming down the stairs to our apartment. He walked in and straight away I could see the relief on his face. My heart finally slowed down and I could breathe normally. Adiel told me that the security officer on patrol had noticed a breach in the fence surrounding the community — he alerted the rapid response team and issued a locked down order. After patrolling the area, scanning the streets, and turning over every loose stone they located a suspect and brought him in for questioning. Thank G-d it ended well. So as I listened to Tzur reciting the security challenges of Shaarei Tikva, I understood him, I could feel his anxiety. Listening to him sharing his stories I could imagine what goes on in his wife’s heart. I asked him why he feels the need to be so involved, risking his life? He shared that six years ago, he lost a friend in a terrorist attack. Lior Farhi was then head of security, and he was murdered at the entrance to the community he loved and called home. Ever since, Lior’s friends, including Tzur, make it their own personal mission to keep the people of Shaarei Tikva safe. Even though Shaarei Tikva is a half-hour drive from my home in Leshem, we share this burden. In a sense, everyone in Samaria and Judea are connected with this one common thread — we face a common threat of terrorism and we want to protect our families, create a safe home environment and lead a normal life. We yearn for peace and security in the Biblical Heartland. I want to invite you to give a donation today to help Tzur with the equipment he needs to protect the families in Shaarei Tikva. Anything you give will be a huge help!